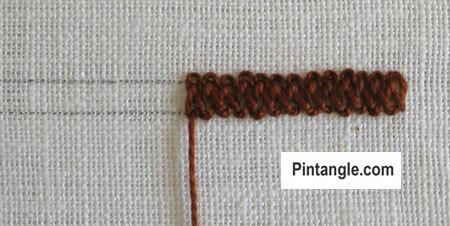 Braid Stitch is a linear stitch that is part of the chain stitch family. It is also known as Cable Plait stitch and Gordian knot stitch. Braid Stitch creates a textured braided solid line which is slightly raised and holds curves well. Braid stitch can be used anywhere that you need a solid line or a fine border. 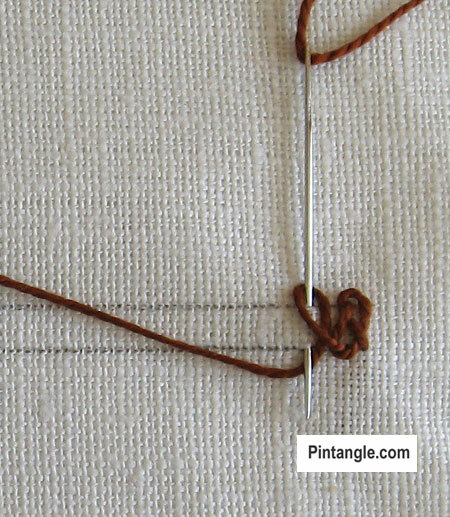 This stitch can be worked on plain or even-weave fabrics in a thread with a firm twist such as cotton perle #8 or #5. Stranded floss is too flat to work this stitch well. When working on an even-weave fabric, one or two of the fabric threads can be drawn out behind the stitches to produce a lacy look. It is important to note that this stitch depends on firm braiding to be successful. Braid Stitch needs to be worked in a narrow band and with each stitch close together otherwise it will not stay in place. If it pops up or looks loose you need to either work each stitch closer together or work the line narrower. If you don’t want to work it narrower increase the thickness of your thread. Braid Stitch is tricky even for intermediate to advanced stitchers as the tension is important, so it must be worked using a hoop. The stitches should be kept close together, small less than 5mm (1/4 in) high, otherwise the loops slip and become loose, and pull out of shape as the braided effect is lost. Bring the needle up through the fabric at the base of the line. 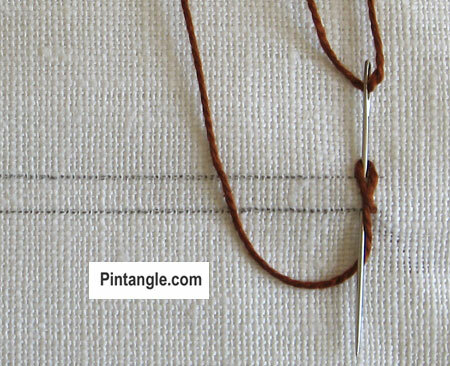 Make a loop with your needle as illustrated. Note that the thread is passing underneath and is to the left of where the thread came up from the fabric.The top thread is wrapped to the right. I make a little loop with my fingers, lay it on the fabric then poke my needle into it. Once I am in the rhythm I wrap the thread around the needle but to start I make a loop. Clumsy I know but it works! I then insert the needle on the top line. Bring the needle out on the bottom line directly below where it is inserted. Do not have the needle on the diagonal. Wrap the thread under the needle. 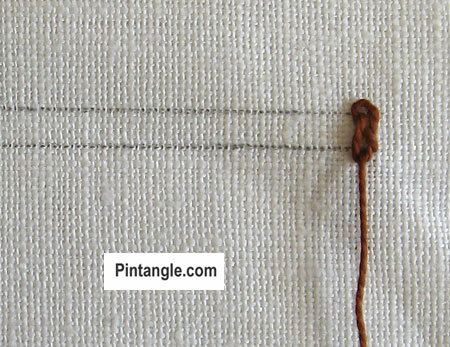 Continue repeating these steps making sure you keep your stitches close together. In the photograph above I have opened out the stitch a little so that you can see what is happening but normally you would work the stitch closer to the last. I hope you enjoy Braid stitch! I had been struggling with this stitch for a long time, getting more and more confused by the illustrations in stitch dictionaries. Then I found Mary Corbet’s video where she is stitching from up to down. That video also taught me to form the first loop with the needle and not shaping it with my fingers on the fabric. Once I got the hang of it it was so easy and fun. When I see and read your directions I can easily understand how the braid if formed. 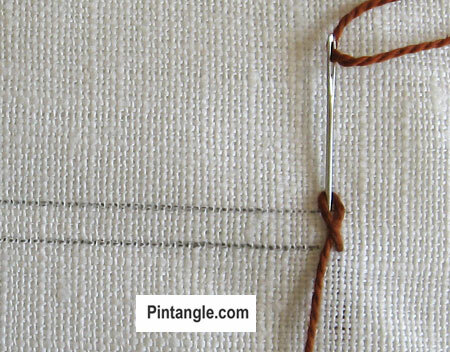 It is SO important to check out a number of ways to make a stitch. Thank you for always supplying us with great illustrations, explanations and information for each stitch. Your stitch dictionary is a gold mine! Hi Sharon Just received your new book today. It really is lovely. I was really excited to get it after Mary Corbet’s review. Congratulations. 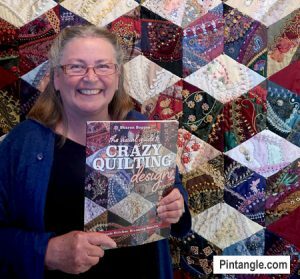 I am looking forward to trying some of your ideas on my next Crazy Quilt. thanks Betty enjoy the book!